The 2007 Belleek Christmas plate is retired and limited to stock on hand. The Belleek Christmas plate features Glendalough Monastery and measures 8" diameter. The fine china Irish plate is handmade in Belleek, Ireland and it is received gift boxed complements of The Irish Gift House. 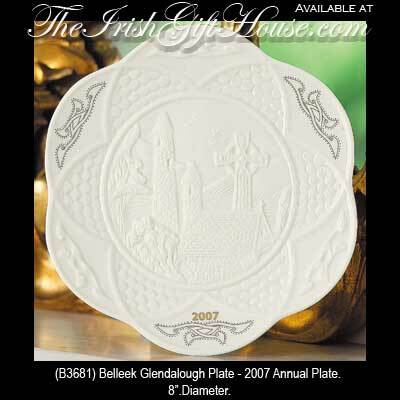 The Belleek Glendalough Christmas plate for 2007 is a limited production of 2,000 pieces and it is individually numbered with a special backstamp. Glendalough is situated deep in the Wicklow Mountains and was chosen by St. Kevin as his site to build a monastery because of its remoteness and serenity. St. Kevin, "Coemghan" in Gaelic, was born into a wealthy family in Ireland in 498. He was baptized by St. Cronan and later studied Holy Scripture under the guidance of St. Petrocus. The reputation of St. Kevin and his monastery in Glendalough spread throughout Europe making Glendalough a popular place of pilgrimage. Probably quite uniquely among Irish saints his feast day is celebrated by both Western and Orthodox calendars on the third of July. However, in Ireland it is celebrated on the third of June.